Valet Parking – Star Line is the ONLY ferry service that offers Valet Parking in both Mackinaw City and St Ignace. Let us park your car in a fenced in area while you enjoy your stay on the Island. Text your valet number listed on your claim check 60 minutes before your departure and we will have the vehicle waiting on our dock. Outdoor Valet Parking is $24.00 per night and Indoor Valet Parking is $38.00 per night (limited availability). 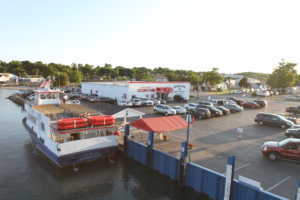 Premium Dockside Day Parking – Park on the dock near the ferry for your DAY trip to Mackinac Island, $10.00 per vehicle. Free Parking – Star Line offers both day and overnight, free, unsecured off site parking. Our Star Line shuttles will pick you up and bring you to where you board the ferry. Handicap Parking – Handicap parking is available in Mackinaw City as well as St Ignace. Please inquire when pulling into one of our docks for more information and exact location. Over-sized Vehicles – If you have a motor home or vehicle with attached trailer please call 800-638-9892 a few days in advance and we will have an offsite parking space waiting for you upon arrival, (cost varies). classicPASS Classic Service for leisurely or budget conscious travelers. Enjoy our 30 to 40 minute ride to and from Mackinac Island. This ticket does have a limited schedule and is only available from June 21st to August 25th, 2019 and August 31st and September 1st, 2019. Departures from Dock #1 in Mackinaw City or Dock #1 in St Ignace. Adults $19.00 per person Round Trip (ages 13 and up), Children $10.00 per person Round Trip (ages 5 to 12), as always Children 4 and under ride FREE!! flexPASS Hybrid Flex Pass features Classic Service on the trip to Mackinac Island and your choice of boats on the return back to the mainland. This ticket does have a limited schedule and is only available from June 21st to August 25th, 2019 and August 31st and September 1st, 2019. Adults $23.00 per person Round Trip (ages 13 and up), Children $13.00 per person Round Trip (ages 5 to 12), as always Children 4 and under ride FREE!! mackPASS Make the most of your trip with our mackPASS ticket. This ticket includes a round trip fastPASS as well as a Mackinac Island Carriage Tour Ticket. You are also able to add on Fort Mackinac, Grand Hotel Lunch Buffet/Admission or Original Mackinac Island Butterfly House Tickets (additional costs do apply for add on activities). Adults $49.49 per person Round Trip and Mackinac Island Carriage Tour (ages 13 and up), Children $23.00 per person Round Trip and Mackinac Island Carriage Tour (ages 5 to 12), as always Children 4 and under ride FREE!! Once our tickets are purchased, they are non-refundable.